The dead cat has had quite a bounce off the October 3rd lows (when a survey of traders found that only 8% were bullish). But this kind of volatility is typical of bear markets. 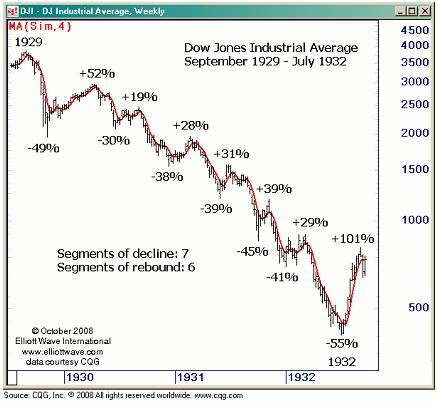 Four out of six of the Dow Jones Industrial Average's largest daily percentage gains were in the bear markets of 2007-8 and 1929-32. Now (10/28/11), 61% of traders are bullish. This is the same number that corresponded with the July 25th 2011 high. (The DJIA lost 2000 points over the next 10 trading days.) In addition, the DJIA has quietly made three subsequently lower peaks (spring, summer and fall). Investors will soon realize that the cat is indeed dead. “Eventually the stock reaches a peak, but the absence of bearish news, along with bullish sentiment, makes the crowd oblivious to the possibility of a major price reversal. While some analysts or market mavens preach caution, or outright gloom, the masses dismiss these warnings… At that point, investor attitude is again one of disbelief. But this time, the disbelief is that the long, upward price trend is over. Bulls still treat these declines as buying opportunities, believing the bad news to be only temporary. The disbelief persists. But as price continues to fall, more and more bulls are discouraged as their positions drop into the red. Investors who earlier bought more shares on price pullbacks are now reluctant to do so again. Soon outright sales begin. Disbelief has transformed into belief that the price trend is definitely down. Selling accelerates. Fresh lows are hit. One by one bulls turn bearish, and investors continue to sell. Calls for new lows are heard. 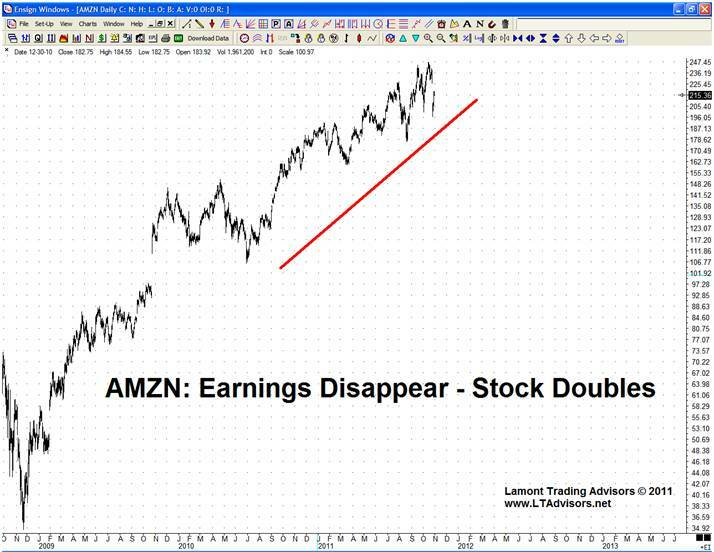 Opinion is decidedly bearish, and the stock is once again on few, if any buy lists. The bottom is finally made.” – Contrarian Investing. By Anthony M. Gallea and William Patalon III. 1998. The Fed and the government can create short term distortions: QE2, cash for clunkers, first time homebuyer tax incentives, etc. But these moves are quickly and completely retraced when they fly in the face of supply and demand. Ultimately, the Federal Reserve will fail at propping up the leverage in the system because the income is not there to service those private sector debts. This will force investors to dump assets, bringing their price back into line with historical measures of valuation. If you do not understand this, feel free to email us and we will explain in more detail as it is critical to our investment strategy. We have reached the point in this long cycle where many folks will be forced to sell their hotels at discount. With regards to timing, Dalio believes that “there are no more tools in the tool kit” (monetary and fiscal policy) to prevent this from occurring. And “no matter what is solved in Europe you will have a deleveraging” which “…means we’re going to have more debt problems.” Sure enough, just a few days later after Dalio’s Charlie Rose interview, European leaders were forced to agree on a 50% loss on Greek bonds which led to the failure of MF Global, the 7th largest bankruptcy in United States history. The sharing appears to be over as the debtors simply cannot service their debts. With Greek bond holders taking a 50% hit, and the ISDA declaring the haircut ‘voluntary’ so as not to trigger an insurance payout, hedged bond investors have been hit with a double whammy. It is as if half of your house was burned down and the government then declares that there was no fire so the insurance company won’t have to pay you. It is no wonder that two days later MF Global filed for bankruptcy. They were a leading derivatives broker which was leveraged 80 to 1 (Remember May’s The Collapse of Leverage) with large bets on European sovereign debt. We have to admit that even we were surprised that MF Global went down without any bailout attempted. MF Global was a primary dealer with the Federal Reserve (only 21 institutions hold that distinction) and was headed by former Goldmanite/NJ Governor Jon Corzine (D) who was rumored to be the next Treasury Secretary of the United States. It doesn’t get any more connected than that. Perhaps the admission that in the last days they were using client funds to illegally cover their European investments made a bailout politically unfeasible. Regardless, relying on bailouts is not part of our investment strategy. As we stated in July 2008’s We Prefer a More Secure Financial Institution: “So in our view, accounts held at Wall Street investment banks and brokerage firms that deal with leveraged players are not secure.” Stay away from the fast money – it’s usually yours going away quickly. As most risk assets have completely retraced their initial gains after the loss agreement in Greece, more fundamental shifts are also taking place: “Oil giant Royal Dutch Shell said it planned to curb its investments in the European Union in future due to doubts about the bloc’s chances of recovering from the crisis.” It is no wonder. Europe expects to borrow money to save Europe from borrowing too much money. It also should not be a surprise then that they are having trouble coming up with the funds. Last week, the ECB was forced to cut a bond sale from $5B down to $3B for its promised bailout fund. This week, they were forced to postpone the sale due to ‘market conditions’. “One question you have to ask yourself if you are investing capital today is: Does debt matter? Because if it doesn’t, go buy stocks, go buy houses, go buy bonds, lever up because everything is going to be fine - if debt doesn’t matter. But if it does matter, like it has for the last 3000 years every time, then you better think a little harder about how you are allocating your assets and why…” - Kyle Bass. (must watch) 1hr AmeriCatalyst presentation. To set the scene, Evercore Partners’ Ken Sena is “constructive” on Amazon stock as he says it “will look very well for people.” Simon Hobbs (in a surprising and welcome change for CNBC) actually challenges him on his extremely bullish forecast. 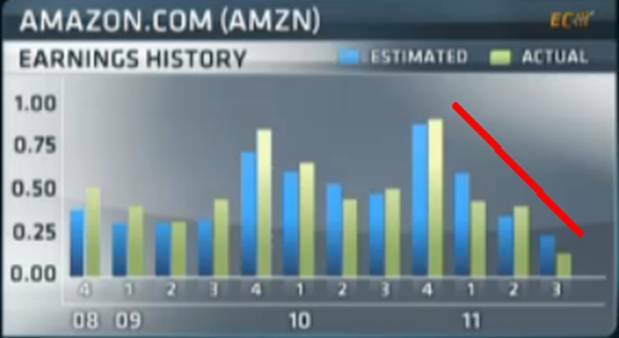 As Ken noted, Amazon’s earnings have indeed been disappearing (chart below). So when you look at the chart that follows of their stock price, which has doubled in the same amount of time, you will see what kind of mentality we are dealing with on Wall Street. Remember Ken thinks the earnings multiple should be significantly higher at 130 to 140 times earnings. Just as a reference, the average P/E ratio is historically 15. Earnings could rise exponentially to make this stock price cheap (hey, anything can happen), but we highly doubt it. Usually, when there is this kind of disconnect between price and earnings it is the price (and CNBC viewers) that bears the brunt of the move. Perhaps we should get Evercore Partners’ Ken Sana together with Ralph Nader to talk stock valuation. “The secret to successful investing is to figure out the value of something – and then pay a lot less.” - Joel Greenblatt. The Big Secret for the Small Investor. 2011. It also appears that MF Global hired Evercore Partners for advice as it sought a buyout in its last days.